Deputy Prime Minister, Nick Clegg, took part in a whistle-stop tour of some of Bristol’s innovative and growing businesses this morning, when he visited Engine Shed to announce a further £18.1m funding through the Growth Deal for the West of England LEP. The announcement included announcing funding for a significant expansion of Engine Shed, as well as two other key projects in the West of England. Initial plans for Engine Shed 2 could triple the amount of incubation and grow-on space currently available for high-tech, social, creative and digital businesses, in the Temple Quarter Enterprise Zone. A tour of Engine Shed (phase 1), Bristol’s newest innovation hub – a £1.7 million refurbishment of Brunel’s original train station, completed in 2013, and a unique collaboration between the University of Bristol, WE LEP and Bristol City Council – followed the announcement. 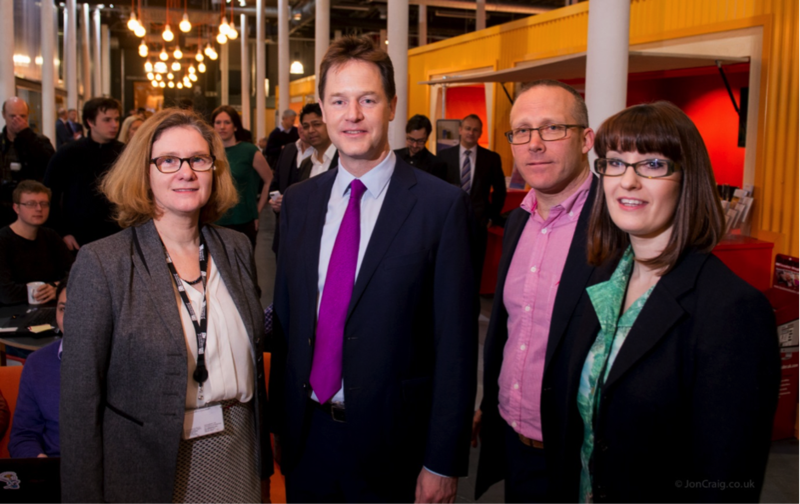 Nick Sturge, director of Engine Shed and the Bristol SETsquared Centre, introduced Nick Clegg to nine fast growing, highly successful SETsquared businesses: Neighbourly, Fusion processing, Systems4Silicon, BluWireless technology, Ultrahaptics, Kubla, FundSurfer, CameraForensics and IdeaSquares. Bristol Elected Mayor George Ferguson and WE LEP vice chairs, Robert Sinclair and Cllr Paul Crossley met with the DPM to talk through the plans for LEP.